According to new study, junk food is as addictive as smoking and taking drugs. 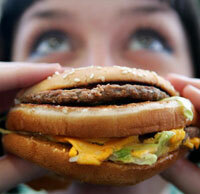 Scientists believe burgers, chips and sausages programme your brain into craving more sugar, salt and fat-laden grub. A study found laboratory rats got hooked on a bad diet just like addicts become dependent on cocaine and heroin. The findings published online in Nature Neuroscience cannot be directly transferred to human obesity but show over-consumption of high-calorie food triggers addiction-like responses in the brain, Scottish Daily Record reported. "This junk food, which is highly palatable, energy dense food, is sort of new as a dietary component for humans, and it’s very different from regular balanced food because it has a high reward impact and can produce changes in the brain similar to what drugs can," Paul J. Kenny, M.D., Scripps Research Associate Professor, told Ivanhoe. The scientists fed the rats a diet modelled after the type that contributes to human obesity easy to obtain high-calorie, high-fat foods. Soon after the experiments began, the animals began to bloat. Latest figures show that one in four people in Britain are obese with married people twice as likely to become obese than their single counterparts. Eight in 10 men and almost 7 in 10 women will be overweight or obese by 2020. Cases of devastating health conditions like heart disease, diabetes and stroke will increase with the nation’s waistlines, the recent Government-commissioned Foresight report warned, Telegraph.co.uk informs.